For a year or so I’d been dreaming about it. About my entire family coming over from America and Canada for Moriah’s bat mitzvah. My parents, my brother and his family, and (for the first time ever) my sister and her family, as well as my mother-in-law and cousin. And the family visit exceeded my already high expectations. Moriah was so happy to have so many relatives at her bat mitzvah. All 11 cousins got along fabulously. And we siblings and our spouses met up for an unprecedented and wonderful brunch together. Not to mention the gratitude I felt to have both of my parents here, in relatively good health, when 2 years ago this month my father was fighting for his life in the Sinai Hospital ICU. So, then, why was it such a challenge to actually enjoy having everyone here? Rather than grumbling about how tired out I was from having so many visitors. How my house was such a mess, because I had no time to clean up with everything going on. How I couldn’t stand to wash one more dish! 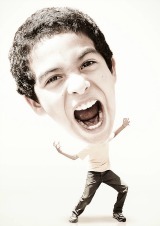 Israeli slang has a term for this conflict–Big Head vs. Little Head. And this morning, on the way back from saying goodbye at the hotel to my almost final visitor, I was thinking that this Big Head/Little head conflict is the most basic challenge I face in my life. I face it constantly in my life as a mother. I face it constantly in my life as an observant Jewish woman. When dealing with the responsibilities that fall into my lap as a result of my greatest dreams coming true. When I am in Big-Head mode–I see the big picture. I see family members that live across the ocean from each other joining together for a simcha. I see elderly family members well enough to travel and receive tremendous nachas from their children and grandchildren. I see everyone in our diverse family that almost never comes all together really enjoying each other’s company. And when I’m in Little-Head mode–I see the challenges. The mess, the dishes, the need for space and routine and sleep. Whenever you are grumbling– about how much you hate x (cooking, cleaning, carpool…) you turn that belief on it’s head. So you exchange “I hate cooking” with “I love cooking” and then you spend your day “spying” out evidence of what you love about cooking. How you love the smell of frying onions, how you love the way your husband says “that smells delicious” when he walks in the door, how you love sitting down and eating the finished product when all your hard work is done. And that was what I did during this family visit. Every morning I said to myself “I am loving this family visit” and thought of at least three ways in which I had. And in that way, my Big Head was able to keep my Small Head largely in check. Which is, as I mentioned, an ongoing battle within my skull and heart. And this bat mitzvah week, at least, I think in the end Big Head won. Brilliant. Thank you for sharing this tip! Mazal tov on your batmitzva.lovely news. I really needed to read this! We’re BeEzrat Hashem making a Bar Mitzvah soon and im getting caught in the little details which are over my head. I’ll try to concentrate on the bigger picture, thanks. Years ago, when we got married, the videographer went around getting quotes from all the family members. My father a”h said “You should enjoy all your simchas together.” At the time, I thought it was just a simple blessing. Years later, when it came time for bar and bat mitzvahs, with all the practical problems and emotional crises, I thought back to what my father said. I realized the importance of the word “together.” It is easier, unfortunately, in difficult times to all come together and put differences aside. It is a thousand times more difficult during a simcha to forget differences and personality issues and messy houses. My father’s words were actually very profound when I thought about it. It’s not always easy to enjoy a simcha together. Therein lies the true bracha he gave us that day. May we all be zoche to enjoy our special moments — together! Chana, you have a knack of directing us always to see past the “little head” obstacles and appreciate the view from the vantage point of the “big head”. I am so glad your family was able to enjoy the simcha together with relatives. A generation ago it was very difficult as so many had lost large parts of their families. The pressure and myriad details that go into planning a simcha are a burden that we should all be zocheh to enjoy! Mazal tov to your entire mishpocha. I think it is wonderful that you took the time to write about this universal challenge.